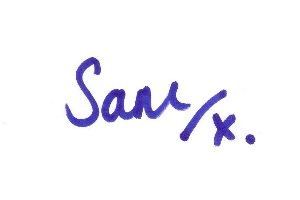 I’m Sam, the creator, editor and visionary for Anything Goes Lifestyle. I created this website as a free resource to women and of course, anyone who may be interested in what we talk about. I love glossy magazines as I am sure most of you do. However, we’re busy, powerful and resourceful women. This is where the concept of AGL comes from; it’s about providing the content you want to see, whenever you want to see it, in a format we think is most convenient to you. Whether you want to see reviews of products and services or read about conducting your own beauty treatments at home or creating delicious recipes and/or shopable features to inspire you, we want to provide this for you. Through our search function or our categories, we hope that you’ll find what it is you’re looking for. If there is something you’d like us to work on which we haven’t covered already, you only have to ask. Our articles have no expiry either. Rather than keeping press clippings or bookmarking pages etc. you can head to our site and pull up any of our existing articles, meaning you’ve a handy resource whenever you need it. In terms of making money from the site, we do this in three ways. Both the website and the newsletter can be sponsored; you’ll see a single advert from our sponsors on every page of the website and at the top of our newsletter. We also run promotional features; for these you’ll either see that it is a promotional feature from within the URL of the page you’re looking at or it will be explicitly stated within the article. We also work with affiliate companies where there is a potential to make commissions from the products we recommend through our site. We’re particularly choosy about who we work with though. We’ll either have first hand experience with those we work with or it is in keeping with the site and what we’re about. Know that we don’t recommend a product based on its commission potential, some of the products we share in these features we actually make no money from at all, we just think you’ll find them of interest. When it comes to links we try and source out products at the cheapest price possible from sites we believe in and use ourselves. When it comes to product recommendations/reviews, we often contact companies and ask to try specific products/services for relevant features. Sometimes they contact us about things they think you’ll find of interest, whichever way, our reviews will be honest with our own thoughts on how to use and our very own top tips. As our saying goes, we’re just passionately curious and want to cover topics and things of interest to you, our readers. We welcome your voice and guidance; we want this to be a site, a community, for you.